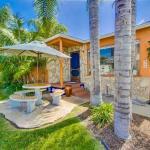 Set in San Diego just 3 km from SeaWorld San Diego Chloes Cottage offers accommodation with free bikes and free WiFi. This apartment is 6 km from University of San Diego and 6 km from Old Town San Diego State Historic Park. The apartment is located on the ground floor and features 2 bedrooms a flat-screen TV with cable channels and a fully equipped kitchen that provides guests with a dishwasher an oven a washing machine and a microwave. The apartment also provides a seating area and a bathroom with a bath. Downtown San Diego is 11 km from the apartment while Balboa Park is 11 km away. The nearest airport is San Diego International Airport 7 km from the property.